The Maelstrom Roleplaying Game is a cult classic. 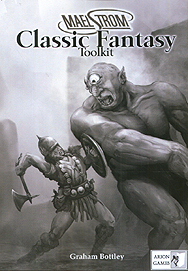 Originally published in the 1980's, but revived for the modern era, this ruleset is incredibly versatile. This book brings a whole new direction to your Maelstrom games. Get your Warriors, Thief, Wizard and Cleric together and enter dark and dangerous dungeons. Track through ancient forests as elven Heroes or through vast caverns as stout dwarves. This toolkit for the Maelstrom RPG provides character creation rules, new Magic rules, equipment and a whole menagerie of monsters.